Can't shop for your size? Just lose weight and nothing fits you? Want to have them fit? Well we have just the place for you! Kim The Tailor will make them fit you like a glove. You will feel better knowing your clothes fits you and looks good on you. Business Suit, Dresses, Gowns, Jeans, & anything that can go through a sewing machine we will do them all. Stop in and experience our friendly and reliable service! 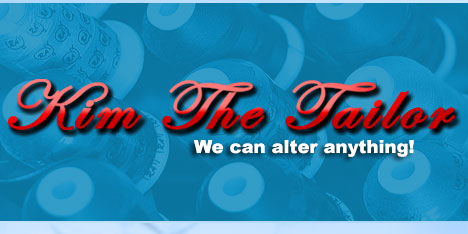 We Specialize in restyling, tailoring, & alterations. 2008 - 2010 © All rights reserved.